These easy DIY ideas for packaging cookies (or other tasty treats) make wonderful gifts with a personal touch for the Holidays. All you need is a roll of cellophane wrap and ribbon to make a quick and easy personalized gift. 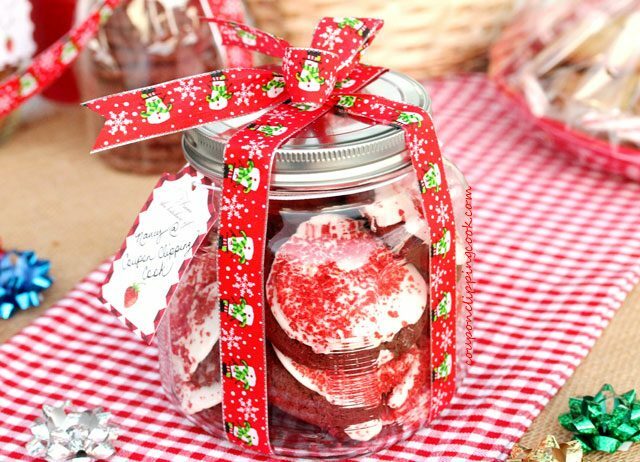 Add a container such as a basket, small bucket, or jar into the mix along with cute Holiday ornaments, colorful candy, and even some milk, and you can make a lovely one-of-a kind gift. It’s especially nice if the cookies are homemade but let’s face it, sometimes it’s hard to find the time to bake cookies with all that’s going on during the Holidays. If you don’t have time for baking homemade cookies no worries, just check out the bakery section at the grocery store for delicious looking festive cookies that can be wrapped up with a personal touch for gift giving. The frosted cookies with the red sprinkles, and the chocolate cookies in the picture above were from the bakery section of a grocery store and they looked so pretty and tasted wonderful. Also, fun or unique cookies from the regular cookie aisle at the grocery store would work too. Like those cute frosted pink and white animal cookies (a fun treat for kids and grown-ups), or those yummy chocolate covered marshmallow cookies, or even cookies that are fancier than that would also be nice. 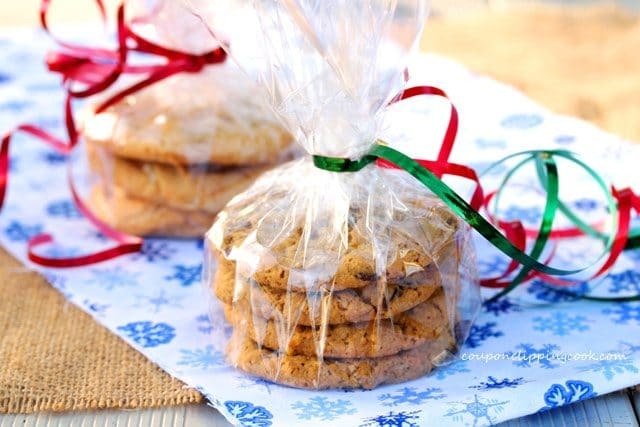 DIY wrapped cookies are great for last minute gifts too. 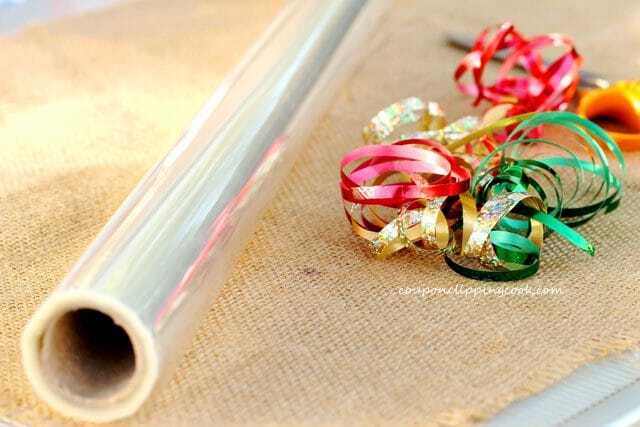 A roll of transparent wrap (cellophane) and some ribbon are super handy to have on hand for making quick gifts out of cookies or other sweet treats. I happen to like curling ribbon because I’m not good at tying pretty bows out of ribbon. Curling ribbon comes in all kinds of vibrant colors and all that’s needed is a pair of scissors to curl the ribbon. You can find curly ribbon at a craft store or even at Walmart. Here’s a video on how to curl curly ribbon from Real Simple.com. So let’s check out these cookie packaging ideas that may give you inspiration for Holiday gift giving. 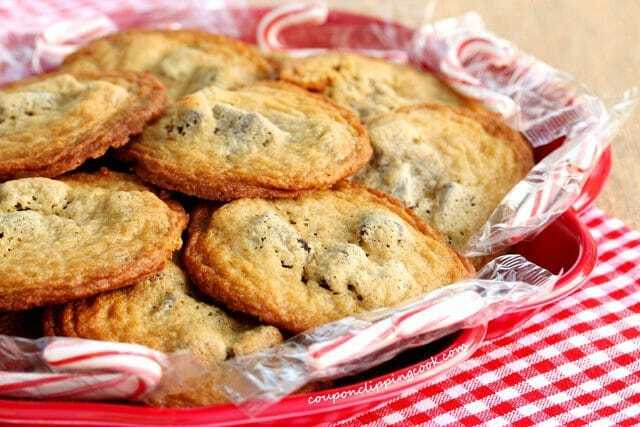 Small batches of cookies make nice gifts for coworkers, friends, neighbors and family. They’re also the perfect size for stocking stuffers. 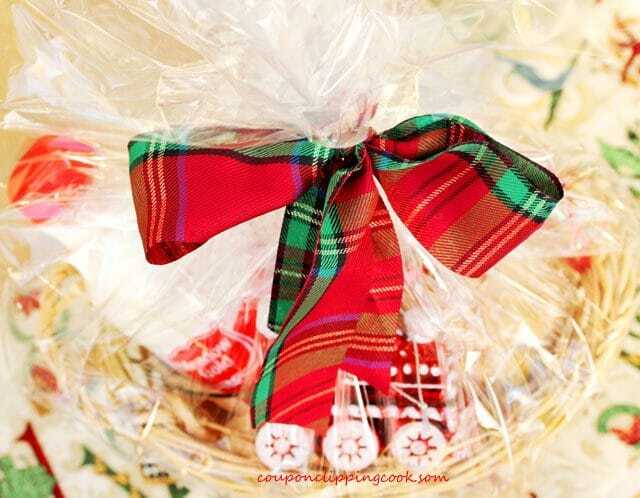 Here’s a cookie gift package using regular ribbon. 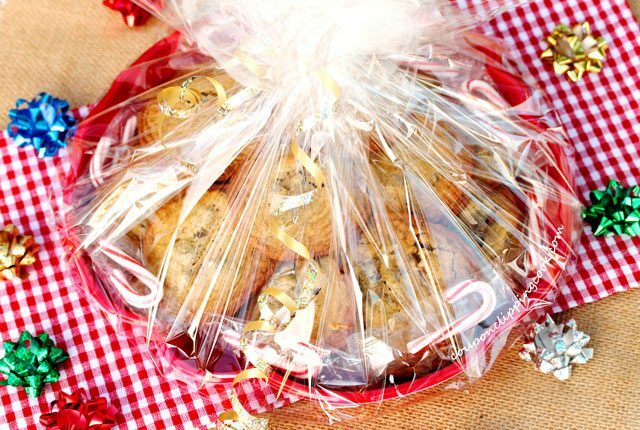 A quick way to package the cookies is to stack them on a large piece of transparent wrap. Cut a long piece of ribbon and set it aside for a moment. Next, pull the corners of the wrap up and gently squeeze the section of the wrap that’s just at the top of the cookies to form a small “neck”. Then tie the ribbon around the “neck” fairly tight and make a bow. Lastly “fluff” up and spread out (or fan out) the excess wrap that’s on top of the cookies. If there’s too much wrap on top, just cut some of it off. Here’s a small batch using transparent wrap and curling ribbon. Multiple colors of curling ribbon can be used and bunched up together so the package looks extra festive. Done. Just like that you’ve made a beautiful gift that someone is sure to enjoy. The wrapped cookies are cute enough as is. 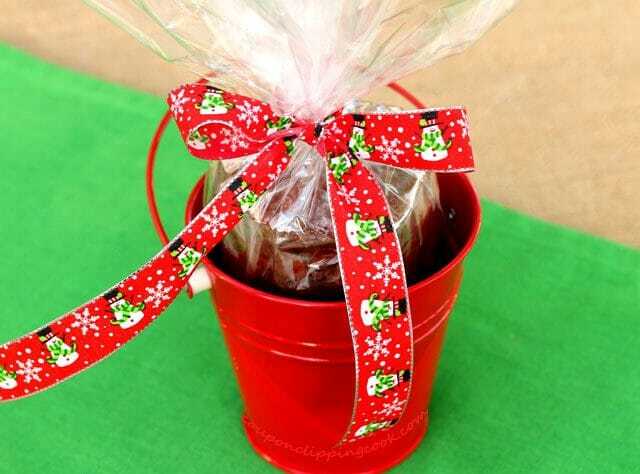 But if you want to get fancy, try putting the wrapped cookies in a cute container like this small bucket. These cute buckets are often available at a craft store. I’ve also found them at Target in the dollar-days-type section that’s in the front just as you walk into the store by the shopping carts. 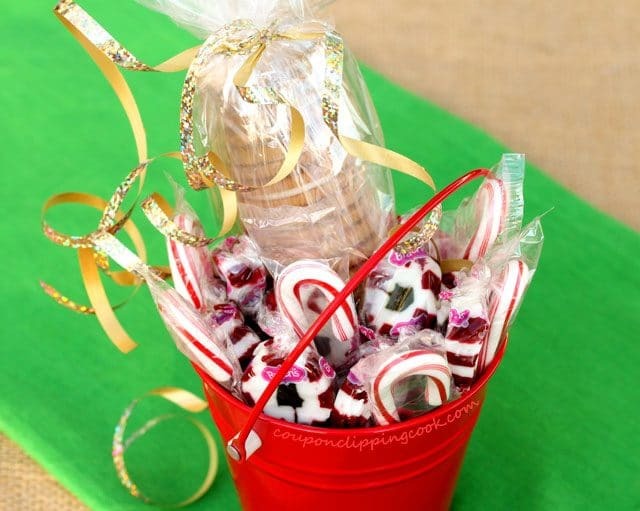 An easy way to add festive color when packaging cookies is to include Holiday candy around the cookies like in this little bucket. Good ole Mason jars. They’re handy for so many things and great to have on hand. Generally they’re sold in a box with multiple jars of the same size in it. Walmart has a nice variety of them to choose from. 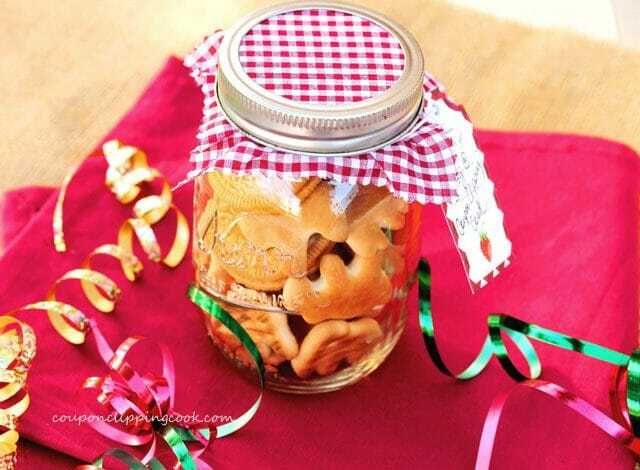 If the cookies are small, they may fit nicely in a Mason jar. An added touch is to cut a piece of fabric in a square and lay it over the flat circular part of the lid. Then tighten the ring portion of the lid right over the fabric. Holiday colored fabric works great for this. Holiday plastic trays are nice to use for a larger quantity of cookies. These trays are found at craft stores and Walmart in the seasonal Holiday decoration area. Some years the trays are still on the shelves just before Christmas but other years it’s hard to find them later in the Holiday season. You know how it goes sometimes, when you’re looking for something it’s much harder to find compared to the times when you’re not looking for something and you just stumble on it. …wrap the transparent wrap in the same fashion as described above by gently making a “neck” in the middle of the tray or plate. Then tightly tie a ribbon around the “neck” and make a bow. Or if using curling ribbon, curl away to your heart’s content. The more colorful ribbon the better right? TIP – When wrapping the cellophane over a larger area such as a tray or plate, the hardest thing is to make the “neck” in the center of the tray/plate. Just don’t tie the ribbon around the “neck” until you’re sure that it’s in the center of the tray/plate. I’ve made the mistake of tying the ribbon up real pretty only to step back and look at how lopsided the wrapping looks because it’s off centered. Gift baskets are one of my favorite things to make. They don’t need to be fancy schmancy either. Just a few items in the basket are fine. 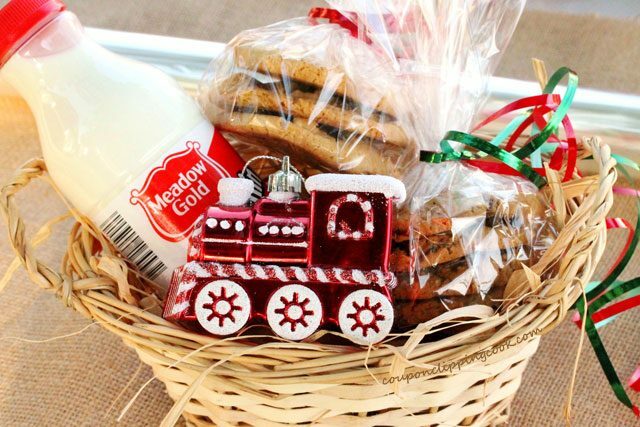 Here’s a gift basket with cookies and milk….and a cute Holiday ornament for good measure. Before adding the goodies to the basket you can add raffia, or green Easter-type grass works great too. Then wrap the basket in transparent wrap (making sure the “neck” is in the center), add a ribbon and wella, a beautiful gift. 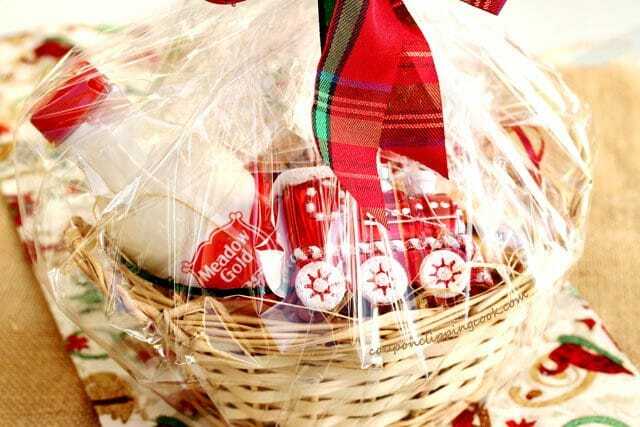 TIP – If putting items in a gift basket that need to be refrigerated (milk, cheese, etc.) make sure the gift basket is kept in the refrigerator. Another idea is to buy clear glass jar-type containers. They’re inexpensive and really show off the cookies. Just add a ribbon and a bow. No transparent wrap is used in this example, I just made sure to clean the jar and dry it out good before adding the cookies. Don’t miss a CCC post. Subscribe to Coupon Clipping Cook and get an email each time we have a new post. Here’s the link to subscribe to CCC. 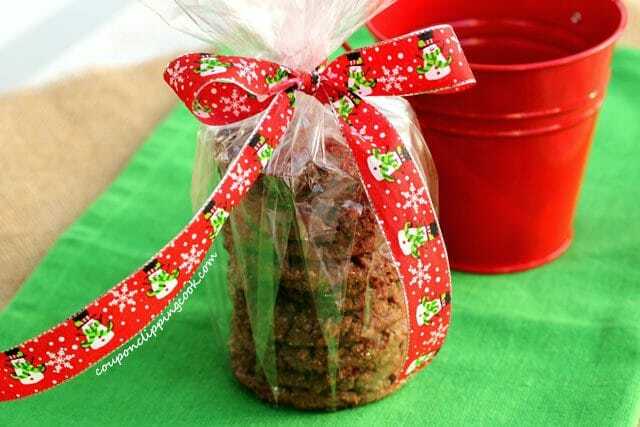 This post “Cookie Packaging Gift Ideas and Tips” was originally posted on October 30, 2012 as a guest on Baker Street. Thanks a lot, Nancy! For great ideas of packaging awesome. Thanks for the great piece of work.